What you see is only a small part of what’s really there. Like an iceberg, the bulk of behavior’s “mass” is found below the surface; it is what gives rise to the part that is visible. Behavior is triggered from feelings, which stem from the more deeply rooted needs of a person. These are not needs like, “I need candy/ I need a new toy/ I need to play video games.” Basic human needs consist of things like autonomy, safety, security, trust, empathy, understanding, adequate sleep and nutrition, a sense of belonging and inclusion, competency, respect, and love. If a child’s needs are not met, he may feel insecure, afraid, angry, or detached. The behavior that shows, then, looks to be what we might call “unacceptable” as the child reaches out to try to satisfy these unmet needs. This occurs subconsciously, of course; a child is not able to articulate: “You know mom and dad, I have not felt included in the family since the new baby arrived, nor have I felt respected when I speak, so I’m going to be whiny and belligerent for a while.” His needs are valid; his feelings are valid. But he is misguided in his attempts to rectify them. 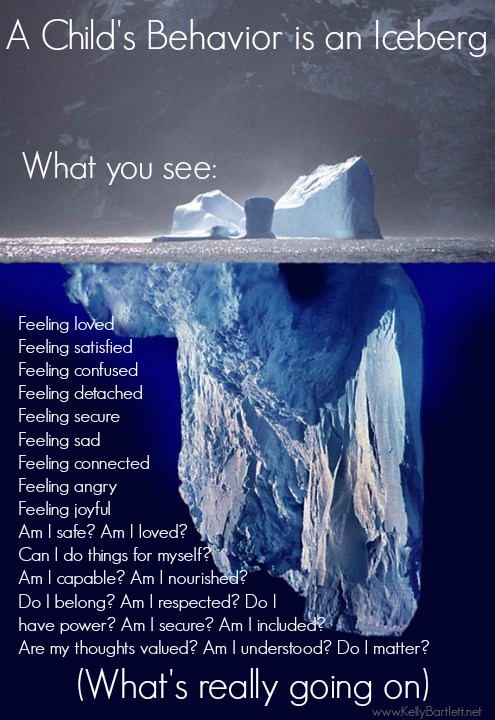 What we must do as parents is, in the face of misbehavior, remember that 90% of what is going on is below the surface. We must look deep to ensure the child is getting everything he needs, for behavior builds from there. What a fantastic post Kelly. Really appreciate the visual – will be sharing this with my community for sure! Beautifully said! Oh, the behavior seen and the unseen is so deep! Is there somewhere that I can purchase this print? I am interested in blowing this up for my office. I am an Early Childhood Special Education teacher and it would be perfect for my office. Are you the original owner of the image or do you know if it can be purchased somewhere? yes Kelly is there a way to get a poster of this. I am a behavior specialist for a large district and this is an important message I need to get teachers to appreciate before judging the behaviors in their classrooms. Where could I get a poster of this? I agree. Chinese proverb also have the same meaning! Can we get permission to use this on our website ? Do not want to violate any copyrights. Yes, you can use it on your website, thank you! Hi Kelly, I am looking to see if it would be possible to utilise this as part of a presentation/training I am devising to highlight the importance of differentiating between what we see and whats really going on for the individual – is this okay? Yes, feel free to use it!